Welcome To Your Complete Guide To The Goldador Dog. A Labrador Golden Retriever Mixed Breed. A cross between two of the most popular and well-loved dog breeds in the world! Cross bred dogs can be controversial as some people believe that pedigree breeds should be kept ‘pure’ and not mixed together. Others believe that mixed breed dogs are healthier and there are relevant facts and opinions on both sides. In our mixed breed information guides we look at the health and temperament of the two parent breeds and at both the benefits and disadvantages of buying mixed breed puppies or adopting a mixed breed rescue dog. Being born from two large and bouncy breeds, the Goldador makes an good pet for active families who will have plenty of time to play with their four-legged friend. In this article, we’ll talk about the Goldador’s lineage, expected general appearance and behavior. We’ll also look at possible health problems and how to avoid them. As well as grooming and exercise requirements, and what you can expect to pay for your very own Goldador. A Goldador is a mixed breed dog that is the product of breeding a purebred Golden Retriever with a purebred Labrador Retriever. If there ever was a better family dog, we’re not sure that you’ll find one more suitable than a Goldador. You’re also not likely to find a better working dog, for many roles! Both Goldens and Labs are known for their excellence in hunting, therapy, and service work. The Goldador being a big player in the world of Guide Dogs For The Blind. We’ll find out why in next section – let’s learn about the Goldador’s history! Where did the Labrador and Golden Retriever cross come from? As a mixed breed, the Goldador’s history can only be traced though its parent breeds. The Golden Retriever breed hails from England and Scotland. Where medium-sized retrieving dogs were needed for bird hunting both on land and in the water. Records show early Golden Retrievers being developed in the early 1800s in Scotland. The American Kennel Club (AKC) formally recognized the Golden Retriever as a member of the sporting group in 1925. While they still make excellent hunting dogs, they are also highly skilled in obedience classes, field trials, and as guide and service dogs. In modern times, Goldens have been immensely popular in movies and media. Every dog lover (or child of the 1990s, as in my case) knows the “Air Bud” movies, and who could forget Duke, the Golden in the Bush’s Bake Beans commercials? We’d also be remiss if we neglected to mention the Golden’s popularity as a family pet. They are normally wonderful with children and other dogs. 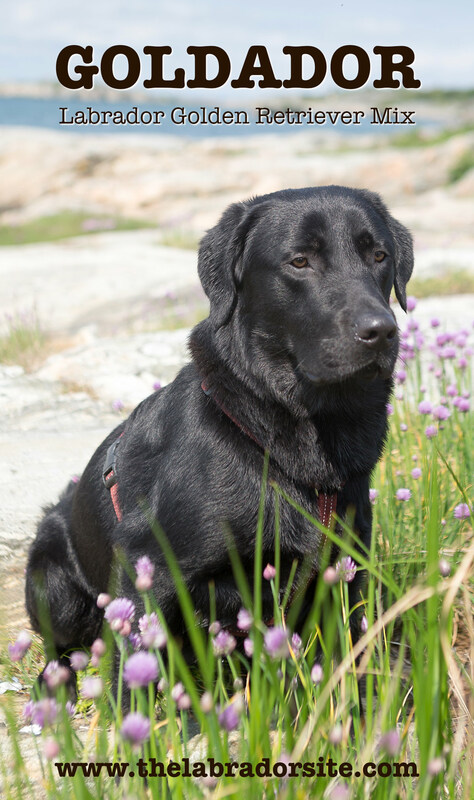 The Labrador Retriever breed was first developed in Newfoundland, Canada, where smaller water-fowl hunting dogs were mated with Newfoundlands. The resulting offspring led to the development of the Labrador Retriever that we know today. The Lab was recognized by the AKC as another sporting breed in 1917. 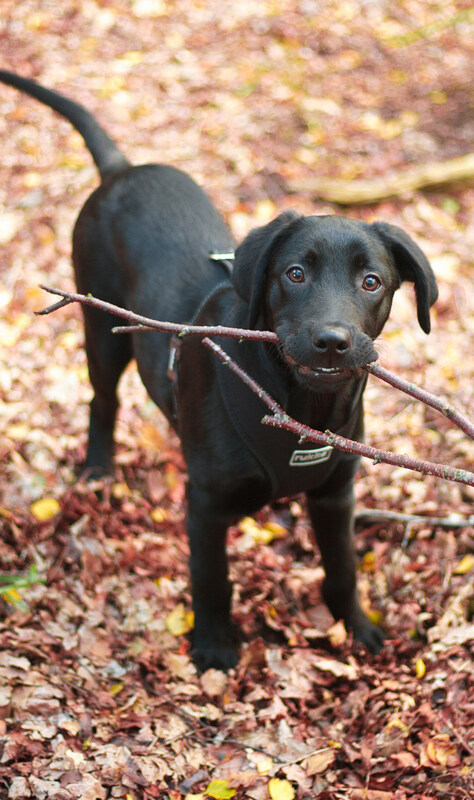 Today’s Labradors are still used as hunting dogs, but they’re also found in the line of service. Like Golden Retrievers, they make amazing seeing-eye dogs, search and rescue dogs, and therapy dogs. Also similarly to Goldies, you’ll find many a smiling Labrador in family households. 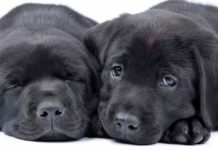 After all, there is a reason that Labradors are the most popular registered dog breed in the United States! There is no specific record of Goldador origins, but we do know that these dogs have been being mixed for a long time at least informally. 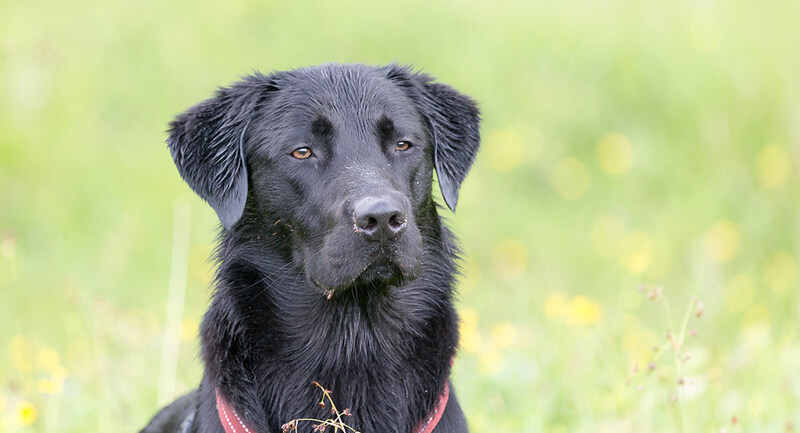 As two working breeds, game keepers and those involved in field sports have been accidentally or deliberately mixing the two in working dogs for generations. What we do know is that there has been a deliberate breeding program at least amongst service dogs for a few years now. The Goldador is a popular cross between these two amazing breeds not just with pet owners, but with Guide Dog societies too. With The Guide Dogs For The Blind stating that they are the most successful guide dog of all! You can’t get much higher in praise than that. Since the Goldador is a hybrid or mixed breed dog, it’s almost impossible to predict the exact temperament of every Goldador puppy. With designer breeds like the Goldador, you can only make an educated guess about their temperament based on the general demeanor of their parents as well as the temperament of the parent breeds as a whole. This means that one Goldador puppy may more closely favor the Labrador’s temperament. While another puppy from the same litter may have a happy mix of each parent breed’s personality traits. 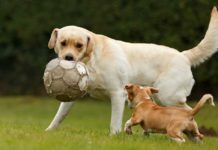 However, as the Golden Retriever and Labrador Retriever have very similar personalities, it’s generally safe to assume a few things. That Goldador puppies will grow into high-energy adults with a love for playing and a passion for retrieving! As highly sociable dogs, neither Labs nor Golden Retrievers do well in isolated settings. So if you cannot spend a lot of time with your dog, a Goldador has the potential to become very destructive to your home due to chewing out of boredom or anxiety. They thrive on interaction with their beloved human and need space to stretch their legs. To follow lots of new scents, and to play fetch, tug of war, to chase Frisbees or other flying toys. Goldadors truly are family-oriented dogs and are the not for people who don’t have the time or space to allocate to them. Another thing to keep in mind if you’re looking to get a Goldador is that they can inherit the Lab’s excitability. As many a Lab lover knows, these dogs do not know a stranger and also aren’t afraid to show how excited they are about meeting new faces! Not only will a Goldador greatly benefit from obedience training to keep him from jumping on guests. But his highly intelligent and “we aim to please” nature will also allow him to excel in the obedience arena. Goldadors are highly competitive in obedience and field trials. Finally, let’s not forget that because both Labradors and Golden Retrievers are retrievers, their noses (and desire to chase after small and fleeting creatures) could lead them into mischief if they aren’t kept in a confined space when allowed outside. We recommend that you have a fenced-in yard or a place that you can let your pooch safely roam and explore. If you’re not prepared to care for and handle a medium- to large-sized dog, then a Goldador is not for you. Based on the expected height and weight of the Golden Retriever and Labrador Retriever, a Golden Lab mix can weigh up to 80 pounds. Females will most likely mature to about 65-70 pounds. Goldador males can measure up to 24.5 inches tall at the shoulder. Females will most likely mature to 23 inches or less. But, don’t let their larger size intimidate you or your family. Goldadors are fantastic family dogs! As we mentioned in the previous section, obedience training can help with jumping and other bad habits that they may develop. Like any mixed breed dog, Goldador puppies may come out looking more like a Labrador than a Golden Retriever, or vice versa. Goldador puppies could come out looking like a black, yellow, or chocolate Lab, or they could be born with the light to dark golden coat of a Golden Retriever. Some puppies will come out looking like an equal mix of each parent. Although the Golden Retriever has a longer coat with some feathering, Goldadors always inherit the Labrador Retriever’s thick double coat. The double coat is a soft undercoat below a rough top coat. Goldadors may have their Lab parent’s short coat length. Or they may exhibit slightly longer and wavier version of their Golden parent’s coat, but without as much feathering as a purebred Golden. As all Goldadors have the Lab’s double coat, a Goldador will need a weekly brushing, maybe more during shedding season. As a mixed breed, Goldadors are unfortunately predisposed to a few inherited health conditions that are common in Labrador and Golden Retrievers. In addition to the common canine ailments that are common across breeds. Hip dysplasia, eye diseases, allergies, and skin irritations. Goldens and Labs are both prone to elbow dysplasia, especially prone to hip dysplasia, and progressive retinol atrophy (gradual vision loss). 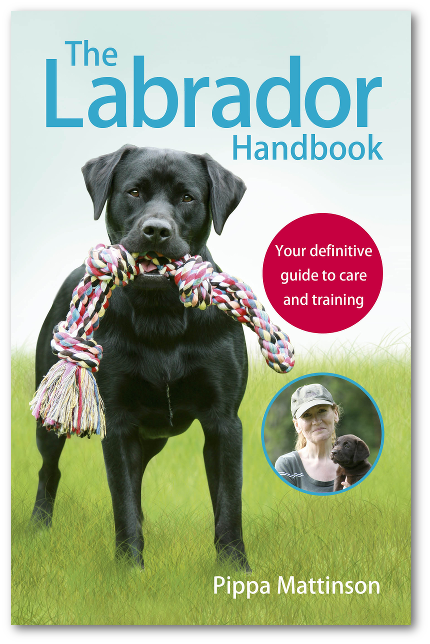 To learn more about the diseases and health conditions that are common amongst Labrador Retrievers, refer to our article on Labrador Health Problems. To learn more about the diseases and health conditions that are common amongst Golden Retrievers, refer to this article on The Golden Retriever. We want to emphasize that Golden Retrievers are prone to carry the cancer gene. Approximately 40% of Goldens die from cancer. According to a 2015 study, approximately 13% of cancer cases in Goldens are of the lymphoma variety, and approximately 28% of cancer cases in Goldens are of the hemangiosarcoma variety. 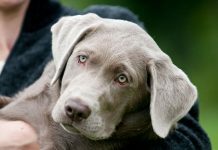 If you’re planning to purchase a Goldador puppy from a breeder, be sure that they test their parent stock to determine any inherited health conditions they may pass on to their offspring…especially cancer-causing genes. Furthermore, make sure that both parents have good hip and elbow scores, are tested PRA clear and have a good eye test of less than a year old. Since both Golden Retrievers and Labrador Retrievers have a tendency to develop elbow and hip dysplasia, you’ll need to keep a Goldador’s weight in check. This is especially important for a mix of two breeds that enjoy eating, as they are prone to weight gain. Weight gain does not lend itself to compromised joint health. Therefore, Goldadors will require regular walks and lots of self-exercise to keep their musculoskeletal system healthy and to keep their weight down. You’ll also want to avoid free-feeding, as these dogs (like many) will happily eat until their bowl is completely empty! Due to the Goldador’s high-energy nature and love of spending time with people, we also recommend that you make time every day to play with your pup. These active dogs enjoy runs, hikes, and swims, so be sure to take them along on your family adventures whenever possible. Designer breed dogs generally live about as long as their parent breeds. So, a Golden Retriever-Labrador Retriever mix can be expected to live for around 10 to 12 years. 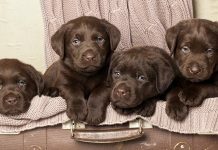 Since the Goldador is a popular designer breed, you probably won’t have to work very hard to find a breeder with Golden Retriever cross Labrador puppies ready to go near you. Goldador prices may vary from breeder to breeder based on how much value a breeder places on their dogs. Especially if their dogs are competitive and not exclusively bred for pets. Make sure you pick an experienced breeder that has carried out the health tests relevant to both breeds and has looked for Golden Retriever lines that are longer lived with lower than average rates of cancer. An older Golden Retriever stud dog may be ideal as he is more likely to have avoided the cancer gene. Looking at the range of breeders above, it appears that the going rate for a Goldador puppy is about $500 to $1,000 or so. If you prefer to adopt or rescue your forever friends, then we suggest looking at your local animal shelters as well as various Labrador and/or Golden Retriever-specific rescues. Although some rescues focus on homing animals of a single breed (usually in an effort to home retired show or breeding stock), some rescues do take in mixed breeds related to their primary breed and place them for adoption. 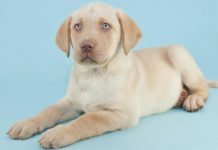 It may be hard to find Labrador x Golden Retriever puppies at rescue, though, as many of the designer dogs that end up at rescues are adults or seniors (e.g., retired breeding stock that have been pulled from puppy mills). With any mixed breed, it can be harder to find a responsible breeder. A litter of Golden Retriever Lab mix puppies is often the result of an ‘accident’, and the female dog is less likely to belong to someone experienced in caring for a nursing mother and her babies. If the litter is planned, it is possible that the breeder is just out to make a few bucks and isn’t as dedicated as they should be. Though that can happen with pedigree breeders too. Especially with fashionable, popular breeds. Is it unethical to buy cross breeds? 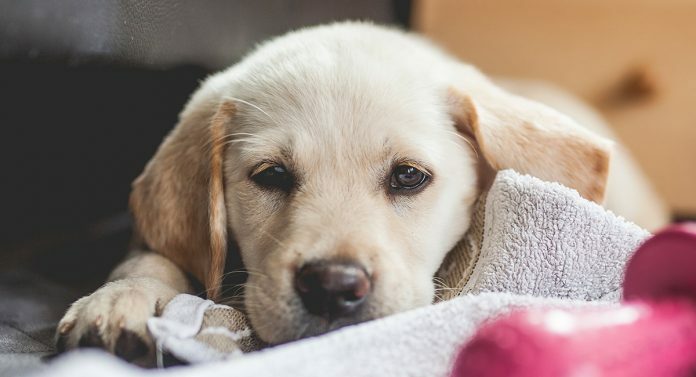 It is common to hear people say that buying a cross bred puppy increases the risk of puppies ending up in shelters but there is no evidence to support this. In fact the overwhelming factor that dog abandoned at shelters have in common is lack of obedience training. Ethics are a personal matter, but buying a well bred puppy from a responsible breeder is not a crime. Whether or not that puppy is a pedigree purebreed, or a cross breed, or a mongrel. All our pedigree dog breeds are inbred to some extent. There is a measure of the level of inbreeding present in any population of animals. That measure is called the co-efficient of inbreeding COI. The higher the COI, the greater the risks of health issues arising specifically from inbreeding. In general, health problems start to emerge if the COI is much greater the 5%. In addition, the Goldador is a proven cross breed that has been intensively used and studied by the Guide Dogs Association for several decades. Is a Goldador dog right for me? Before purchasing any puppy or adult dog, you should carefully consider all aspects of the breed. The Goldador is the combination of two somewhat large dog breeds. They will quickly outgrow a small apartment or home that doesn’t have a large or open floor plan. In short, if you’re looking for a lap-sized dog, then the Goldador is not for you. The Golden Retriever Lab mix may also exhibit the Labrador’s over-excitability. This can overwhelm some people, but can be toned down with proper obedience training. If you are like many people, then you’ll be away from home for an extended amount of time during the work week. This is not ideal for a Goldador. They thrive on human interaction and do not like to be isolated. Furthermore, if you do leave a Goldador alone, then you may come home to destruction! Goldadors may inherit their Lab parent’s love of chewing. But they may chew out of anxiety, stress, or boredom. If you do have the space and the means to properly care for a Goldador, then we recommend that you also have a fenced in area for your dog to roam so that he doesn’t get lost while following his nose. They will love all of the attention that they receive from you, your children, and your guests – if you’re looking for a watch dog, a Goldador will probably fail epically. As far as up-keeping goes, a Goldador will need a weekly brushing to keep their double coat from creating too much mess. They may require a bit more grooming during shedding season, but shouldn’t shed quite as much as a purebred Golden. A healthy Goldador puppy can make a wonderful family companion, and active friend. Tonomura, N.; Elvers, I.; Thomas, R.; Megquier, K.; Turner-Maier, J.; Howald, C., et al. “Genome-wide Association Study Identifies Shared Risk Loci Common to Two Malignancies in Golden Retrievers,” PLOS Genetics, 2015. Previous articleLab Pointer Mix – Is This The Dog For You? 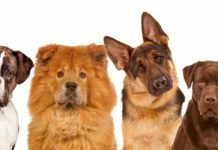 Next articleMixed Breed Dogs – Is It Wrong To Create Hybrid Dog Breeds? Live in North suburban IL and looking for a yellow goldador but having a hard time trying to find some in the area (WI included) – any suggestions on local reliable breeders? Thank you! Have you been able to find one? We live in Norther IL and looking as well! Jazz is almost 2 yrs old. She is a very intuitive dog, she really listens hard to everything you say, trying to hear a word she knows. Swims every day. She is very bossy and demand barks at us when we talk to each other and not her. We play catch with her fav frisby after swimming. She jumps and flips to catch it. If we did not give her that much exercise time and constantly strive to keep dominance she would easily be deemed a bad dog. But she isn’t at all, just full of energy and so loving. She does run away when we sneeze and brings us pillows. Cutest ever. She looks more like a black lab. I live in the beach areas in Southern California. I am looking for a yellow Labrador mix with golden retriever. Anyone know of a place I can find one here. I would Ike a female puppy. I live in Ohio and recently lost my 9 month old goldador to a school bus that hit and killled him. I miss him so much. He was a very smart dog. I want to get another one. Can someone help me find one in Ohio? It doesn’t have to have papers. I would greatly appreciate any help I can get. I am looking for a Goldador female pup! I have been for months!! Please help! I’m in NC but and willing to do what it takes! We have a black goldador, which we were told (and met the ‘parents’) that Mum was a brown lab and dad a golden retriever. 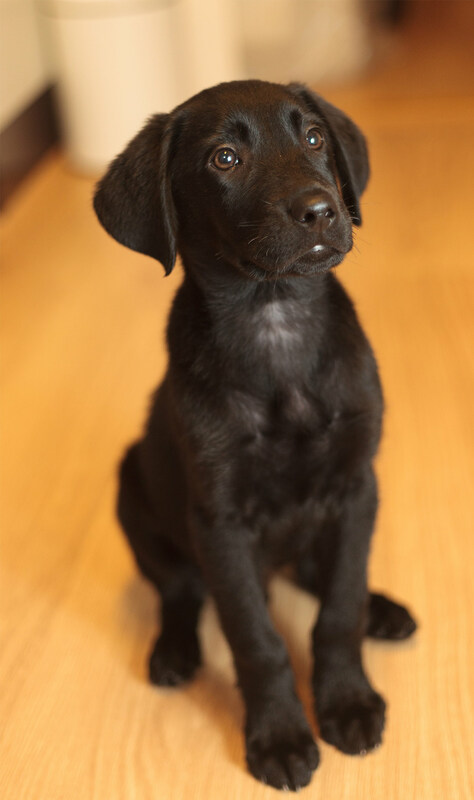 Obviously the Mum is not in question, but we’ve since been told that a brown lab and a golden retriever could not genetically make a black puppy, so the dads identity is now in question in our minds. Can anyone confirm if this is possible or not? Our “goldador” whom we have always referred to as a mutt is the best dog in the world. She is the product of a stud golden retriever and a working lab. We got her at ten weeks and she trained herself. As soon as her vaccinations were complete we took her out off-lead, with a bag of chopped up cooked chicken in my pocket (an advantage of greedy dogs is that they’ll do anything for food). She followed us, her pack, and soon learned her name, my whistle and I also clicker trained her although I’m not sure it was necessary. I have walking and balance problems which were worse when she was a youngster; she has never jumped up on me nor run into me: she once caught me on the back of the knees with an oversized stick; her spatial awareness ended at her whiskers, but only once. As a youngster she would walk for three hours in the morning and another half hour in the evening. She’s now nine and walks an hour and a half in the morning and an hour at night but it’s a middle aged plod rather than the mad dashes into the bushes and out again in which she used to indulge. On vet’s orders she is no longer allowed to chase and retrieve balls but she finds them all the time: lost by dogs with inferior noses, and I make her sit whilst I throw them into dense vegetation so that she has to use her nose and her brain to find them. She never fails. Until age 2/3 she chased squirrels and pigeons but she gave up on both: they cheat and work in three dimensions. What more can I say: I love her and she’s well worth the tumbleweed hair collections on my floors. I find this kind of cool that I have a boutique breed. I got her for half price since a chocolate lab somehow got in with a golden in heat. We joke to people about having a mutt with papers. The awesome thing is that she looks like a black golden which is great because I wear alot of black clothes so her shedding hair doesn’t show much. I have often said that there should be a boutique breed with this combination. She is beautiful, playful, very loving and the easiest dog to train (will do anything for food and approval). Does anyone know of a reputable breeder in the South Alabama/Mississippi/Florida panhandle area? I’ve lived with and cared for many different animals throughout my life, but my 1.5 year old lab/golden mix has probably been the easiest to train with the nicest, most easy going temperament I’ve ever seen. He’s a big snuggler, a great hiking partner, but also a good couch surfing, fellow Netflix watcher. As long as they get enough exercise, Goldadors are fabulous…at least in my experience. My goldador, Brody, believes he is a lapdog. 85 pound lapdog. Also he is a hugger. I live in Indiana. I wondered if any of you could point me in the direction of a reputable breeder. I don’t want to “GOOGLE” and end up with a product of a puppy mill or run into anything less than someone who breeds the best in health and for the right reasons. This will be a family pet…not for breeding or showing or anything other than a companion that will be spoiled and loved! I thank you in advance for any information you can provide. We got Blake from a breeder in Lebanon, Pennsylvania. Don’t remember the name, but pretty easy to find. Blake is the best dog ever!